The Prius-fighting 2017 Hyundai Ioniq, which starts at a hybrid version and works its way up to fully electric, debuted last month at the New York International Auto Show. But for collision repairers, the lesson isn’t the powertrain — though you better know which version you’re working on and the SOP for doing so — it’s the body keeping the car light enough to handle a non-traditional combustion engine. “Ioniq sought significant weight reduction targets without compromising fun-to-drive and comfort characteristics,” the OEM wrote in a news release March 23. 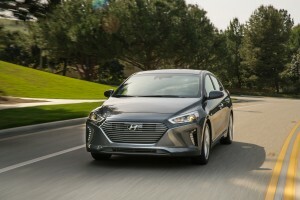 Hyundai built the Ioniq hood, tailgate, bumper beams and parts of the suspensio out of aluminum, calling it 45 percent lighter than steel for those applications. Unfortunately, Hyundai doesn’t reallly share OEM collision repair information with the U.S., though its subsidiary Kia does, according to I-CAR. 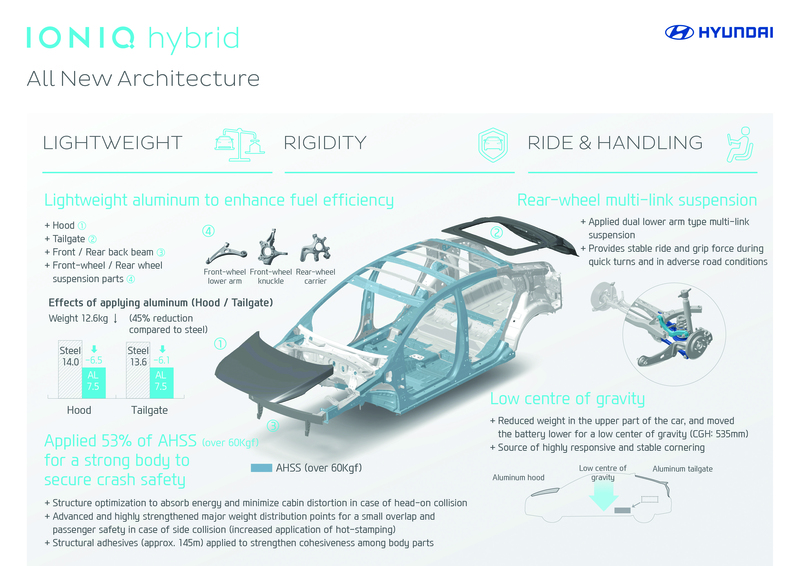 Shops working on the Ioniq might have to rely on I-CAR and its best practices for assistance — for example, if you don’t know what the steel is, don’t section — though perhaps Hyundai’s introduction of a certification program will help spur that material to appear in America. 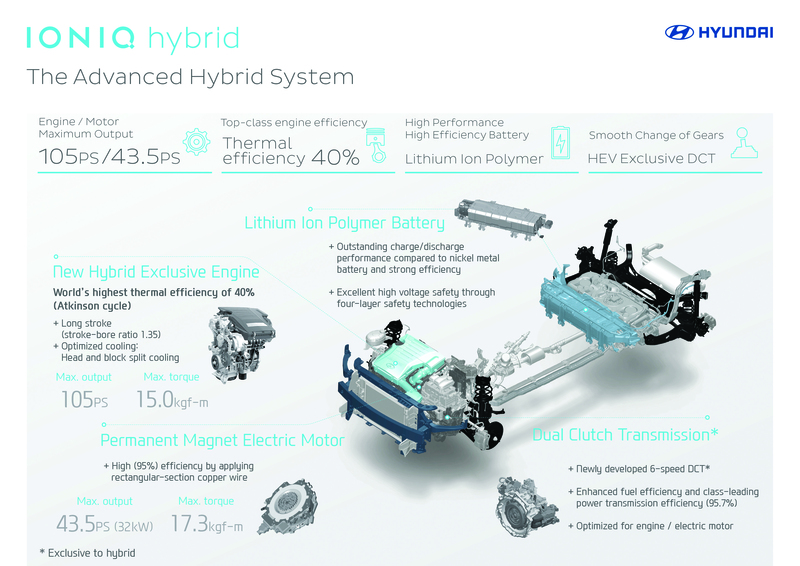 If a wreck requires new tires, the Hyundai hybrid and plug-in hybrid suspension benefit from “low-rolling resistance tires,” the OEM notes. Don’t expect it to fight the all-electric Chevrolet Bolt or Tesla Model 3 without some serious incentivizing to sway a driver. The all-electric Ioniq’s range is only 110 miles, about half of what its rivals are claiming. The OEM threw out the 12-volt, lead-acid auxillary battery used in other hybrids and saved 26 pounds. Hyundai expects to sell 77,000 cars across all three models worldwide, according to Reuters — which noted that figure was 80 percent higher than all the hybrids the OEM sold in 2015. So it’s a fair bet you’ll see one — probably a hybrid — particularly if gas begins to climb in price. 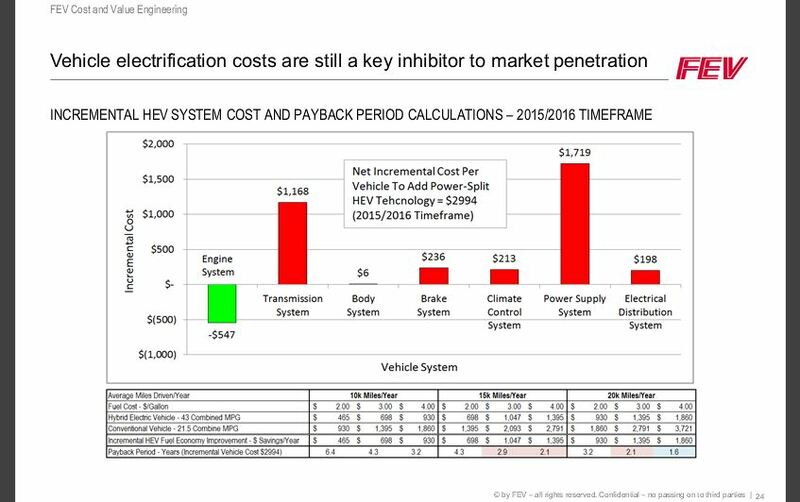 Here’s an FEV slide from a Megatrends webinar Wednesday showing how hybrids make more sense at certain gas and mileage price points.